Optically clear ceramic glass offers extremely high transmittance. Water-repellent (WR) coating reflects only 0.24 percent of visible light, thereby minimizing flare and ghosting. Its protective coating effectively repels water and dust while fingerprints are easily removed with a quick wipe. Clear Glass Ceramic offers a Vickers hardness number of 700HV. This is a level of hardness much higher than that of chemically strengthened glass, which is used in conventional high-strength protective filters. Moreover, this higher level of hardness helps prevent scratches and chips, which can lead to breakage of the filter. 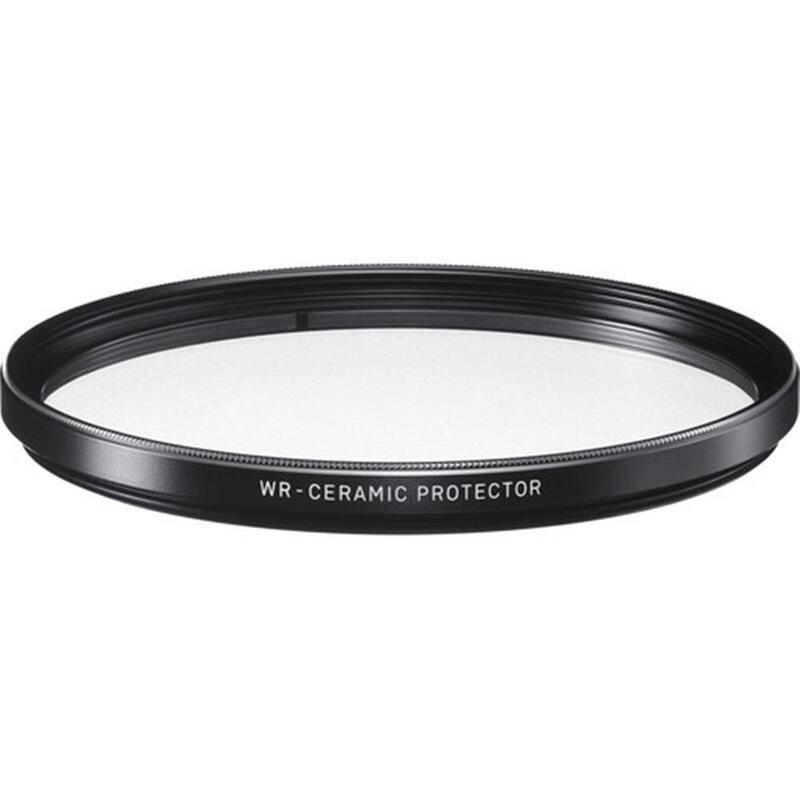 Since Clear Glass Ceramic is extremely strong, the Sigma WR Ceramic Protector is up to 50 percent thinner and weighs up to 30 percent less than previous Sigma filters while offering a higher level of strength. SIGMA's Clear Glass Ceramic offers very high transmittance, making it ideal for use as optical glass. When pitted against the standard coating offered by other brands, the benefits of Sigma's ultra-low reflection multicoated optics are crystal clear. Digital camera CCD or CMOS sensors are highly reflective objects and therefore susceptible to reflections. These reflections could spoil your photographs. Sigma Professional Filters have an ultra-low reflection multi-coating that dramatically reduces potential of sensor reflections and flare. Black-Rimmed Glass Reduces light reflection off filter edge. Premium Hard Anodized Black Frame Finish Aesthetically functional design that blends well with the fit and finish of professional lenses. Low Profile Filter Rim Prevents vignetting with wide-angle focal length lenses. Designed to accept lens caps. Easy-Grip Filter Edge Non-slip mounting and removal of filter. Applicable to all but the Standard Protector Filter, the anti-static coating helps prevent static electricity from attracting dust and other particles, which can easily be blown off the filter if they do adhere. Applicable to all but the Standard Protector Filter, the surface of the filter is specially coated to offer excellent water and oil-repellent performance. Watch water and oil ricochet while dust that does adhere blows away and fingerprints removes with one wipe. Low-profile filter rim prevents vignetting with wide-angle focal length lenses. Made of a special acrylic that is both stronger and more flexible, this storage case is designed to outlast others of its kind. The outer acrylic case is molded for optimal integration with the inner elastomer holder, creating a filter holder designed to last many years with minimal deterioration. It comes equipped with a closure system designed to prevent accidental open or closure during normal use.